When making a copycat recipe, the key is to highlight the items that you can’t tinker with for fear of making a dish (albeit delicious) that doesn’t truly taste like the original. 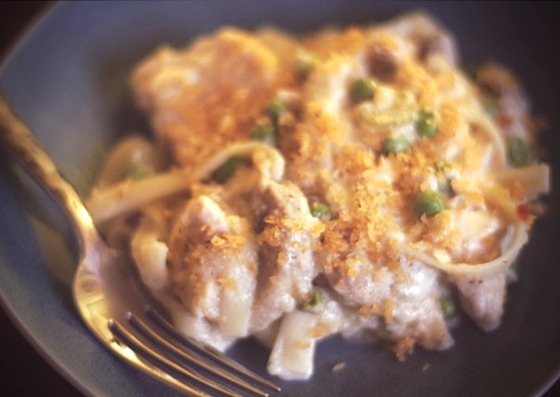 Everyone and their mama’s got a tuna noodle casserole recipe. And I’m sure it’s tasty enough. But to scratch this unrelenting itch, I don’t want their damn recipe. I want something that tastes like Stouffer’s. For me, most of the ingredients were easy enough to figure out – break fettucine in thirds for the noodles, use the best albacore in water you can find for the tuna, and leverage buttered panko for the topping. However, getting the creamy bechamel perfect took a little longer to figure out. After baking, the noodles would absorb too much sauce to keep the final product lush and lovely. And the play of sherry and whole milk became critical for binding all of the flavors together – substitute either and you’d be left with inferior casserole action. Whether you give a flying fig about Stouffer’s or not, this recipe is pretty damn majestic on its own. In fact, it managed to convert my father from declaring his hatred for hot tuna to feasting on seconds-thirds-fourths of the stuff. Fine by me – now I have yet another excuse to whip up a pan of comfort food at its best. P.S. I totally fibbed when I told you that I have guilt over eating Stouffer’s frozen Tuna Noodle Casserole. No shame in my game. I noodled with this recipe because I wanted to be able to make epic portions of this comforting goodness, and have enough leftover to feed an army, choke a baby, and do the backstroke in afterwards. Yes. Tuna Noodle Backstroke. Don’t hate. If you don’t care about mimicking Stouffer’s recipe, you can monkey with most of the ingredients, replacing the pasta and veg for whatever you’d like more (roasted red peppers, farfalle pasta, shitake mushrooms, aged cheddar, leeks, glitter). However, only a sucker would replace the whole milk or sherry in this one. I mean it. And you are totally not a sucker. Preheat the oven to 350. Next, fill a large pot with water and salt it until it tastes like the sea. Bring to a boil. While the water is doing its thing, let’s work on the bechamel. Melt the stick of butter or margarine in a large sauce pot and add the celery. When its translucent, add the mushrooms and minced onion. Cook until fragrant, about a minute or so, and then mix in the flour, coating the vegetables. Give it another minute to do its thang, and then pour in the sherry. Let the booze cook off and then slowly dribble in the milk, stirring constantly to prevent lumps. Add the black pepper, white pepper, nutmeg, celery seed and salt. Taste for salt and add a little more if need be. Better now than later, lovelies. Turn off the heat and let it hang out. Once the water is boiling, plop in your fettucine and cook it for the longer time listed on the package instructions. You’ll want your noodles cooked beyond al dente so as to help them absorb more water. This is how they get all blubbery in the casserole, making you feel like you’re slurping up this goodness while being hugged by a teddy bear. Drain the pasta and pour out into a large, buttered casserole dish. Mix in the sauce and the frozen peas (Yep, frozen! Because bright green peas taste far better than gray mushy ones). So the tuna doesn’t dissolve into the casserole, flake off large hunks of tuna and stud the pasta with the chunks. Think albacore land mines in your majestic casserole. Put the entire thing in the oven and let cook for 15 minutes. While the casserole bubbles away, let’s work on the topping. Melt the remaining 4 tbs. of butter or margarine in a skillet over medium-low heat and toss in the panko, black pepper, paprika, onion powder and thyme. Cook until crumbs are golden and start to toast. Turn off the heat and set aside. Once the casserole has been in the oven 15 minutes, remove from the oven, top with the crumbs and bake another 15 minutes. Remove from the oven and let sit for 5 minutes before doleing out into bowls. Or not. I’ve been known to eat this directly from the pan. Because it’s a scientific fact that it tastes better that way. Sounds delicious and would warm me up on these cold fall days! Truth! Why is it that when it starts to get cold, all I want are bubbly crocks of casserole (replete with melty cheese and crisp crumb toppings) and warm, spicy mugs of hot apple cider? I feel like it’s encoded in my DNA.